A symbol of Bathala, supreme god of the Tagalog people. 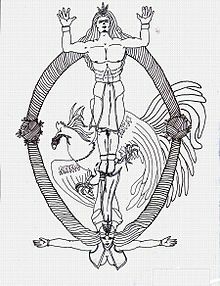 The symbol also depicts a loyal anito at the bottom area and a tigmamanukan bird, which is sometimes wrongfully portrayed as a sarimanok. T'nalak or T'boli people's clothes with designs dreamed by the weaver. The dreams are believed to have been sent by the T'boli deities. 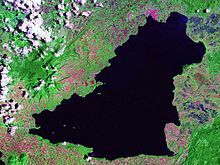 The Maranao people believe that Lake Lanao is a gap that resulted in the transfer of Mantapoli into the center of the world. A variety of sword hilts made from wood, metal, and carabao horn in the southern Philippines, depicting mythical reptilian creatures. The designs are believed to ward off evil spirits and bad omens. 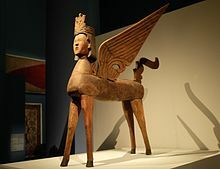 Philippine mythology is incorporated from various sources, having similarities with Indonesian and Malay myths, as well as Hindu, Muslim, Buddhist, and Christian traditions, such as the notion of Heaven (kaluwalhatian, kalangitan, kamurawayan, etc. ), Hell (impiyerno, kasamaan, etc. ), and the human soul (kaluluwa, kaulolan, etc.). Philippine mythology attempts to explain the nature of the world through the lives and actions of deities (gods, goddesses), heroes, and mythological creatures. The majority of these myths were passed on through oral tradition, and preserved through the aid of community spiritual leaders or shamans (babaylan, katalonan, mumbaki, baglan, machanitu, walian, mangubat, bahasa, etc.) and community elders. The term 'Philippine mythology' has been used since the 20th century by successive generations as a general term for all mythologies within the Philippines. These "mythologies" are practiced as valid religions by the native people, the same way Shintoism is practiced as a valid religion in Japan or Christianity is practiced as a valid religion in Europe. Each ethnic group in the Philippines has their own distinct mythologies (or religion), pantheon of deities, and belief systems. For example, the mythology of the Maranao people is completely different from the mythology of neighboring Subanon people, while the mythology of the Hiligaynon people is also completely different from the mythology of the neighboring Suludnon people. The Philippines is composed of more than a hundred distinct ethnic peoples, according to a 21st-century map published by the Komisyon ng Wikang Filipino, the Atlas Filipinas. Philippine mythologies and indigenous religions are largely referred since the Spanish era as Anitism, meaning "ancestral religion". Today, many ethnic peoples continue to practice and conserve their unique indigenous religions, notably in ancestral domains, although foreign and foreign-inspired Hispanic and Arabic religions continue to interfere with their life-ways through conversions, land-grabbing, inter-marriage, and/or land-buying. Various scholarly works have been made regarding Anitism and its many topics, although much of its stories and traditions are still undocumented by the international anthropological and folkloristic community. Unlike dead religions such as Norse mythology, living religions such as Philippine mythologies and Japanese mythology continue to develop up to this day due to inevitable dynamics in belief systems in the modern century. Kayangan lake in Coron is a sacred abode for the Tagbanwa people and their deities since ancient times. Limestone burial urns with myth-inspired patterns from Cotabato dating back 600 CE. Philippine mythology is known today primarily from the collection of oral traditions passed down from generation to generation. There are few surviving written accounts from the pre-colonial period, and even less is written regarding the mythology. Written accounts of mythological beliefs, however, persist, and multiple authors have compiled the more famous myths. Documents on mythologies (or indigenous religions) in the Philippines are almost non-existent due to the destruction brought by Spanish colonialists and friars during a 300-year colonial rule, where the Spanish destroyed and burned indigenous scripts and places of worship. Records of the destruction of the scripts and places of worship have been published by respected historians and anthropologists from various universities. Due to the nature of the archipelago, having no central government or nation-state at the time before the arrival of the Spanish, there is no one definite mythology in the Philippines. Different regions were influenced by different cultures and so developed overlapping stories and beliefs, each with their own gods, goddesses and heroes. There is therefore no one canonical text that details a common mythology for the pre-colonial Filipino people. There are secondary sources in the form of written works regarding the subject. Juan de Plasencia wrote the Relacion de las Costumbres de Los Tagalos in 1589, documenting the traditions of the Tagalog people at the time. Other accounts during the period are Miguel de Loarca's Relacion de las Yslas Filipinas and Pedro Chirino's Relacion de las Island Filipinas (1604). Books on the topics of Philippine mythology and folklore has also been published in numerous occasions by various universities throughout the country, such as Mindanao State University, University of San Carlos, University of the Philippines, Ateneo Universities, Silliman University, and University of the Cordilleras. The publication of these books range from the 16th century to the 21st century. Majority of sources are from thousands of oral traditions passed on from generation to generation. These oral traditions have slowly been waning since the introduction of Christianity in the 16th century, but have made resurgent ripples since the 21st century due to sudden interests among the masses, notably the youth, coupled by various mediums such as literary works, television, radio, and social media. Like other religions and belief systems throughout the world, the mythologies (or indigenous religions) in the Philippines have been constantly evolving even up to the modern century. Many Filipinos have reverted back to their respective indigenous ethnic religions. Mayon volcano, a UNESCO biosphere reserve, is believed to have sprouted from the burial ground of lovers Magayon and Pangaronon. 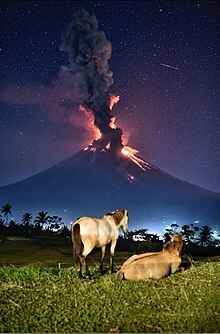 Later, the supreme god of the Bicolano people, Gugurang, chose Mayon as his abode and repository for the sacred fire of Ibalon. Bulul or Ifugao rice deities which are bathed in animal blood through sacred rituals performed by a mumbaki (Ifugao shaman). Sunset at the edge of Kanlaon Volcano. The Hiligaynon supreme goddess, Kanlaon, is believed to reside within the huge land mass. A recorded drawing of a folklore motif-based karakoa, a type of indigenous ship that was faster than Western-made galleons. The usage of karakoas declined due to Spanish persecution. Each ethnic group in the country has their own distinct pantheon of deities and belief systems. Some ethnic groups have a supreme deity, while others revere ancestor spirits and/or the spirits of the natural world. The usage of the term "diwata" is mostly found in the central and southern Philippines while the usage of "anito" is found in the northern Philippines. There is also a 'buffer zone' area where both terms are used interchangeably. The etymology of diwata may have been derived from the Sanskrit word, devata, meaning "deity", while anito's etymology may have been derived from the proto-Malayo-Polynesian word qanitu and the proto-Austronesian qanicu, both meaning "ancestral spirits". Both diwata and anito can be translated into deities (gods and goddesses), ancestral spirits, and/or guardians, depending on the associated ethnic group. Each of the supreme deities per ethnic people is completely distinct, even if some of their names are the same or almost the same. Kadaw La Sambad and Bulon La Mogoaw – husband and wife, supreme deities of the Tboli people; Kadaw La Sambad is the sun god, while Bulon La Mogoaw is the moon goddess; both deities are said to reside in the "seventh heaven"
Mangindusa, Polo, Sedumunadoc, and Tabiacoud – four supreme deities of the Tagbanwa people; the first, Mangindusa, (also called Nagabacaban) is the lord of the heavens who sits up in the sky and lets his feet dangle below, above the earth; the second, Polo, is the god of the sea and a benevolent spirit who was invoked as a healer in times of illness; the third, Sedumunadoc, is the god of the earth whose favor was sought in order to have a good harvest; and the fourth, Tabiacoud, is the god who lived in the deep bowels of the earth. Other ethnic peoples such as the Manobo people have a multitude of deities or nature spirits but do not consider any deity or spirit as 'supreme' from the rest, despite having a deity which 'created the world'. Research on various ethnic peoples throughout the country are continually being conducted by students, government officials, and scholars to further document and conserve the mythology, folklore, and pantheons of more than a hundred different ethnic peoples. The Jama Mapun people's cosmology is extremely vast. Examples of figures in their cosmology are Niyu-niyu (coconut palm), Lumba-lumba (dolphin), and Anak Datu (two sons of a datu spearing another figure, Bunta – a blowfish). A Maranao torogan with okir motif. Okir developed prior to the arrival of Islam in the Philippines and is used to create patterns reflecting myths and folklore. Mount Madia-as, the sacred mountain home of divine lovers, Sidapa, god of death, and Libulan, god of the moon. The mountain is also where Sidapa measures mortal lives through an ancient sacred tree. Lakapati – hermaphrodite goddess of fertility from Tagalog mythology; the Obando Fertility Rites was originally dedicated to her and two other deities until the Spanish came. Each ethnic group in the Philippines has their own creation myth, making the myths on creation in the Philippines extremely diverse. In some cases, a single ethnic group has multiple versions of their creation myth, depending on locality and sub-culture from a larger 'mother' culture. Like Asian cultures, some ethnic groups' creation myths have flood motifs, such as the Ifugao people's creation myth, and/or egg motifs, such as the Mandaya people's creation myth. Other creation myths have similar stories, differing only in the names of deities and small details such as the creation myths of the Bicolano people and the Visayan peoples. In some, the land of the dead is much emphasized with love and affection like the creation myth of the Teduray people. In others, planets and other heavenly abodes were mentioned as home of the deities, such as the creation myth of the Kapampangan people. There are also creation myths which involved wars between royal divinities such as the creation myths of the Mangyan peoples and the Aeta peoples. The culture of trinity of deities is also present in some such as the creation myths of the Tagalog people and Bukidnon peoples. Additionally, giants and not deities were also depicted as creators in some myths such as the creation myths of the Ilocano people, B'laan people, and Manuvu people. An Ifugao woman performing sacred Hudhud chants while harvesting rice. The chanting, recognized by UNESCO as a "Masterpiece of the Oral and Intangible Heritage of Humanity", tells a variety of stories, including the life and journey of the Ifugao epic hero, Aliguyon. The upper part of a manananggal, hunting for food. The monster can be killed by putting salt or garlic on the wound of its lower portion left on the ground. This way, the upper part will fail to re-connect with its lower section, thus killing it once daylight comes. A sculpture of a sarimanok, a sacred bird which causes good fortune for the Maranao people. The fairy bluebirds are believed to be the tigmamanukan omen birds of supreme god of the Tagalog people, Bathala. A simple drawing of a tikbalang, a race of half-horse, half-man beings. A 400-year-old balete tree from Lazi, Siquijor. Baletes are noted as homes of various supernatural beings in many ethnic mythologies in the Philippines. Stingray tails, known as buntot pagi, are used as curse deflectors and weapons against evil spirits and magic in numerous ethnic belief. 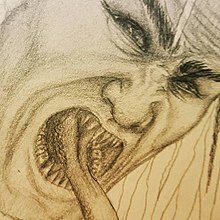 pugot – originally a strange headless race with fire-like capabilities from Pangasinan and Ilokano mythologies; Spanish colonialism later changed its image into a "headless priest"
marukos – a race of crossroads demons in Ilocano mythology, known for waylaying large travelling groups and causing them to be lost until the entire group is drowned by flashfloods. Particularly associated with the etymological legends of Rosario, La Union. Various types of kalasag (indigenous shields with myth-motifs) displayed in the National Museum of Anthropology. A variety of modern Filipino charms and talismans called anting-anting or agimat. A Hiligaynon woman depicting a babaylan (Visayan shaman) during a festival. 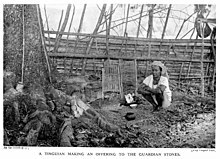 A mandadawak (Itneg shaman) making an offering to a pinaing (sacred communal Itneg spirit-stone). The Ticao stone inscription. Ancient traditions on suyat calligraphy were among those destroyed by Spanish colonialism and are being revived today. Indigenous shamans (called babaylan, balian, katalonan, walian, machanitu, mumbaki, mandadawak, tao d'mangaw, bahasa, baglan, duwarta, and many other names depending on the associated ethnic group), were spiritual leaders of various ethnic peoples of the pre-colonial Philippine islands. These shamans, many of which are still extant, were almost always women or feminized men (asog or bayok). They were believed to have spirit guides, by which they could contact and interact with the spirits and deities (anito or diwata) and the spirit world. Their primary role were as mediums during pag-anito séance rituals. There were also various subtypes of shamans specializing in the arts of healing and herbalism, divination, and sorcery. Numerous types of shamans use different kinds of talismans or charms known as agimat or anting-anting. Shamans were highly respected members of the community, on par with the pre-colonial noble class. In the absence of the datu (head of the domain), the shaman takes in the role of interim head of the domain. Shamans were powerful ritual specialists who had influence over the weather, and can tap various spirits in the natural and spiritual realms. Shamans were held in such high regard as they were believed to possess powers that can block the dark magic of an evil datu or spirit and heal the sick or wounded. Among other powers of the shaman were to ensure a safe pregnancy and child birth. As a spiritual medium, shamans also lead rituals with offerings to the various divinities or deities. As an expert in divine and herb lore, incantations, and concoctions of remedies, antidotes, and a variety of potions from various roots, leaves, and seeds, the shamans were also regarded as allies of certain datus in subjugating an enemy, hence, the indigenous shamans were also known for their specialization in medical and divine combat. Their influence waned when most of the ethnic groups of the Philippines were gradually converted to Islam and forcefully converted to Catholicism. Under the Spanish Empire, shamans were often maligned and falsely accused as witches and "priests of the devil" and were persecuted harshly by the Spanish clergy. The Spanish burned down everything they associated as connected to the native people's indigenous religion (including shrines such as the dambana), even forcefully ordering native children to defecate on their own god's idols. In modern Philippine society, their roles have largely been taken over by folk healers, which are now predominantly male, while some are still being falsely accused as 'witches' and 'madmen', which has been inputted by Spanish and American colonialism. In areas where the people have not been converted into Muslims or Christians, notably ancestral domains of indigenous peoples, the shamans and their cultural traits have continued to exist with their respective communities, although these shamans and their practices are being slowly diluted by Christian religions which continue to interfere with their life-ways. Mount Makiling, a bundok dambana (mountain shrine), home to Makiling, the anito sent by Bathala to aid mankind in the area. The site has been declared an ASEAN Heritage Park in 2013. 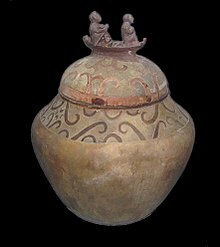 The Manunggul Jar, dating 890-710 BCE, was found in Tabon Cave in southern Palawan. Two prominent figures at its cover represent the journey of the soul to the afterlife. Mount Apo is a sacred mountain for the Manobos, Bagobo, Ubos, Atas, K’Iagans and Tagacaolo peoples. Mount Pinatubo – home of the powerful Kapampangan moon god, Apûng Malyari, who also rules over the eight sacred rivers; in contrast, the neighboring Mount Arayat is the home of the powerful sun god of war and death, Aring Sinukûan, who taught the early Kapampangans the industry of metallurgy, woodcutting, rice culture and waging wars. The Laguna Copperplate Inscription (900 AD) showed pre-colonial people already had complex organizations centuries before Spanish colonization. The writing system used predates other known suyat scripts such as baybayin. A couple belonging to the Sambal warrior class (1580's Boxer Codex). The female warrior is holding a raptor, which has captured a bird, for sacred falconry. 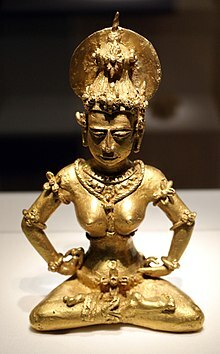 The Golden Tara, considered by many as an integral national treasure of the Philippines, is one of the many myth-based gold crafts made by pre-colonial people in the Rajahnate of Butuan. Despite the progressive stature of the ethnic people's cultural achievements, based on values from belief systems, many of these achievements were destroyed upon the imposition of Spanish colonialism from the 16th to 19th centuries. The purge on indigenous belief systems and their achievements was later continued by the Americans in the early 20th century. Within that colonial time frame, many values were replaced by colonially-imposed toxic masculinity, notions that a woman must be quiet and submissive towards men, inferiority complex among the commonfolk and children and superiority complex among the elites and perceived adults, backward notions on marriage and virginity, backward notions on divorce and women's rights, religious fanaticism, and disregard for the natural world and its wildlife. Today, many of the cultural achievements and values of the native people, based on non-colonial belief systems, have been fragmented, but are gradually being revived by more modern generations. Due to progressive waves of social reforms globally, many of the native people's non-colonial achievements based on belief systems have even been falsely branded as "Western notions" such as 'equality for all', when in fact, these beliefs systems have been known to the native people prior to colonization, as far back as the 15th century, and possibly even farther than 900 AD - centuries older than today's "progressive Western notions" - as complex organizations have already developed prior to 900 AD, as exemplified in the content of the Laguna Copperplate Inscription. ^ Gaioni, Dominic T. (1985). "The Tingyans of Northern Philippines and Their Spirit World". Anthropos. 80 (4/6): 381–401. JSTOR 40461052. ^ Castillejos, Ma Roda Teresa Z. (February 5, 1976) Dagiti Managdadakes. South La Union Forum. Official Campus Paper of the Southern La Union National High School. ^ Sals, Florent Joseph (2005). The history of Agoo : 1578-2005. La Union: Limbagan Printhouse. p. 80. ^ Scott, W.H. (1994). Barangay: Sixteenth-century Philippine Culture and Society. University of Hawaii Press. ISBN 978-971-550-135-4. Retrieved 18 July 2018. ^ Ferdinand Blumentritt (1894). "Alphabetisches Verzeichnis der bei den philippinischen Eingeborenen üblichen Eigennamen, welche auf Religion, Opfer und priesterliche Titel und Amtsverrichtungen sich beziehen. (Fortsetzung.)". Wiener Zeitschrift für die Kunde des Morgenlandes. 8. Orientalisches Institut, Universität Wien. p. 147. ^ Hernandez Kahayon, Alicia; Limdico, Magdalena; Santiago, E M (1989). Panitikang Filipino: kasaysayan at pag-unlad: pangkolehiyo. Metro Manila: National Book Store Publishing Inc. pp. 32–33.